Paul studied at the Royal College of Music to Masters level and at the University of California. He then returned to the Royal College where he completed his Doctorate. He has appeared as a soloist in the United Kingdom, Europe and North America; has been broadcast on Radio 3 and Radio 4 and has appeared on soundtracks including broadcasts on BBC 2, Channel 4 and the Discovery Channel. Concerti include Heinz Holliger, Siebengesang, Lutoslawski, Double Concerto (including performances with the composer), Strauss and Mozart. Most recently, he has given two performances of Gary Carpenter’s Doubles and Edwin Roxburgh’s Elegy for Ur. 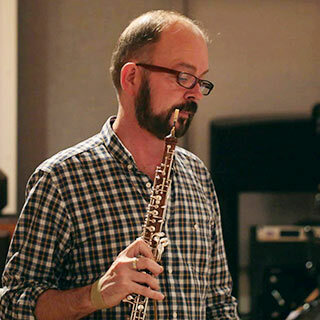 He is the oboist with the contemporary chamber ensemble Sounds Positive, with whom he has given over sixty premières at venues including the Royal Opera House, St. John’s Smith Square and the Colourscape Festival; with composers such as Stephen Montague, Simon Bainbridge and Judith Weir. He also performs with rarescale across the UK, with whom he has premièred over thirty works. He continues to commission new work through his collaboration with leading composers and contemporary ensembles. His solo CD New Ground, features seven world première recordings and was rated ‘excellent’ by BBC Music Magazine. This was followed by a disc of music by Edwin Roxburgh, Antares. This includes a piece written for Paul by the composer, and also contains two ensemble pieces which feature RNCM musicians, conducted by the composer. More recently, he recorded Gary Carpenter’s Double Concerto Doubles with Linda Merrick and the RNCM Wind Orchestra conducted by Clark Rundell. He has given classes and adjudicated at the Royal Academy of Music, the Royal College of Music, Guildhall School of Music and Drama, the National Youth of Orchestra of Great Britain, Chetham’s School of Music and the Park Lane Group, across Europe and in seven conservatoires in China; and has been a jury member of BBC Young Musician, Yamaha YMFE Scholarships and the British Composer Awards. He is also an active composer. Recent projects include a series of contemporary oboe etudes, a piece for Sounds Positive, a Trio for rarescale, a Trio for Tempest, a Piano Sonata, a song cycle for soprano and chamber ensemble and his Concerto Hohler Fels for bass flute, doubling alto flute, C flute and piccolo written for Karin de Fleyt, flautist with the Stockhausen Estate, was premièred and recorded in November 2013. For eight years, before moving to the Royal Northern College of Music to be Head of Wind, Brass & Percussion, he was Head of Faculty at Trinity College of Music and a Council member of the Society for the Promotion of New Music. He was then Director of Performance at the RNCM for one year before taking up his role as Vice Principal (Performance) in September 2014.